Ben Barba celebrates a try during the 2016 grand final. 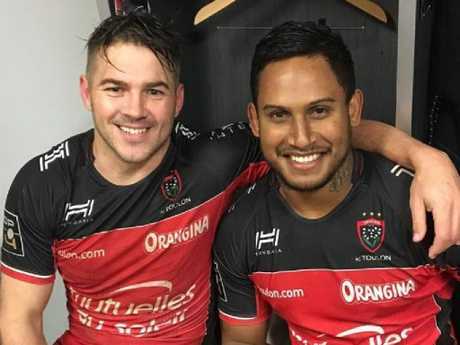 FORMER rugby league golden boy Ben Barba admits he is on his last chance in the NRL, as he opens up about the cocaine ordeal that represented "the worst time of my life". In an exclusive interview with The Sunday Mail, Barba spoke of his lifeline with the North Queensland Cowboys, and today breaks a two-year silence on his moment of madness following Cronulla's 2016 premiership win. Barba was once rugby league's ultimate pin-up boy after the shy kid from Mackay became an NRL superstar when he won the prestigious Dally M Medal in 2012 as the code's No.1 player. But he has been absent from the NRL for the past two years, the result of his second offence for using cocaine, forcing the attacking whiz to revive his footballing career in French rugby and the English Super League. After being handed a 12-month deal by the Cowboys and cleared by the NRL, Barba is back. The 29-year-old father of four daughters is determined to atone for his sins and has a simple message - he will never dabble in drugs again. "I won't be touching the stuff. 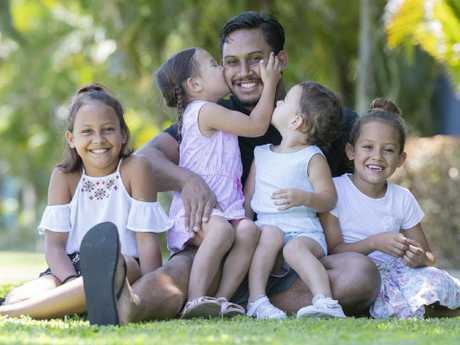 Definitely not," said Barba, who returned to Australia with partner Ainslie and their young family a fortnight ago after his stint with English club St Helens. Barba went from hero to villain in an emotional rollercoaster in 2016. On Sunday, October 2, he played a key role in Cronulla's 14-12 grand-final defeat of Melbourne, giving the Sharks the first premiership in their 49-year history. 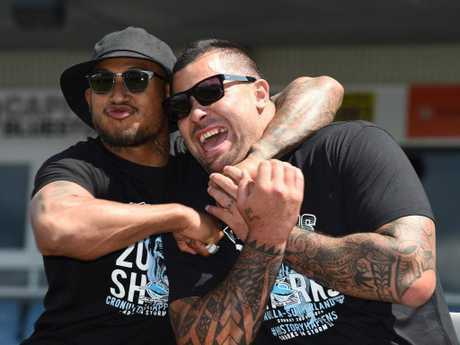 Four days later, while signing Sharks memorabilia, the Cronulla squad was greeted by drug testers from the Australian Sports Anti-Doping Authority. Barba recorded a positive test to cocaine. The Sharks were shattered. His world caved in. Hit with a three-month ban, which left him unable to meet mortgage repayments, Barba headed overseas to make ends meet. "It was the worst time of my life," he says. "ASADA got me when we were signing jerseys ... The drug testers turned up and called a number of us forward for testing. I was one of the guys nominated. "To be honest, I thought I was clean. When I did the stuff, I thought it would be out of my system and I would be OK, but I wasn't alright and then my life changed forever." Asked to explain why he turned to cocaine, Barba says: "It was the euphoria of premiership win, 100 per cent. All I dreamt about as a kid was winning a Grand Final and when we did it, I basically got caught up in the emotion of it all. "For two days, I was on beers and alcohol and my head was all over the shop. We were the first Cronulla Sharks team to win a premiership and I just didn't think wisely. I got caught up in the moment and I enjoyed myself in a wrong and stupid way." Barba has had alcohol problems and twice sought help by checking into rehab clinics, but he has a promise to Cowboys fans and NRL authorities - he does not have a drug or alcohol addiction. "I don't have a problem," he said. "In England, I was never in trouble. I got drug tested a few times over there and was clean every time. "I have to thank St Helens for that, they backed me all the way and that enabled me to enjoy myself and get my passion back for rugby league. "A few times I haven't made the right decisions and I've had to be a lot more mentally tougher now with the friends I choose and who I hang out with. "Being in the Super League, it's been a blessing because it got me away from any bad influences and allowed me to relax and go about my business without worrying about everyone else. "It's easy for someone to say you've learnt from it, but the truth is I got in trouble twice for the same offence. I had to grow up. I've had to be honest with myself about the choices I make both inside and outside of football." A veteran of 168 NRL games, Barba is rated one of the code's most gifted attacking players and he can't wait to repay North Queensland's faith. "It's been a long journey and big a learning curve," he said. "It's great to be back with a team that is basically my hometown team."